The hot wind blows across my face as I continue on…one step at a time…walking out the path set before me. The quiet, the stillness, the knowledge that I am alone threatens to overwhelm me at times, but I press on, believing that if I take just one more step perhaps I will find what I’m looking for. My lips are cracked, my skin hurts from the flying sand whipping across my arms, and my mouth seems to be stuck closed for need of water. My journey has been long and I’m feeling the need for refreshing, for rest. I pause to wipe my brow. I set down the burden on my back, stretch my legs, and take an assessing look around. As far as I can see it’s desert. Slowly scanning the horizon I spin myself around to look back at the path I’ve just travelled. Already the footprints I left behind have been hidden beneath the dust and dirt. I think to myself, “No one will even know I walked through there. There’s no evidence of the work I did, of the difficulties I pushed through.” My heart sinks as I realize that everything I toiled through has come to nothing. I strain my eyes and spot one or two places I remember stopping a ways back. There, to the left a little, is where I found that lake. What a wonder that was! And over there is the tree that had been covered in fruit…it was exactly what I’d needed at that time. In some ways I can remember those stops as if they were yesterday…but at the same time I feel so far removed that they’re just a distant memory. No use longing for what’s past. What’s done is done. I made my decisions. I chose my path, and now I have to finish it out. It’s just that I can feel myself getting to the point of complete depletion. Moving from oasis to oasis has worked to this point, but it seems to me they are getting fewer and farther between. Just how long do I have to go before I find another? Will I even make it? And even if I do, what’s the point if when I turn around and look back, there isn’t even anything to show for it? I sigh…stoop to pick up my bag…and set my shoulders to move onward. But before I take the first step my ears catch the sound of something. It’s an interesting sound. It’s as if it’s calling to me. I almost feel as if I recognize it, but I can’t quite put my finger on it. No, wait…I have heard it before, I’m sure of it. Actually, I’ve heard it more than once along my journey. It’s coming from just over the ridge to my right. Maybe the sound has been there all along, but I’ve just been so focused on getting one foot in front of the other that I haven’t paid attention to it, or maybe I’ve just learned to ignore it. But this time, I can’t push aside my curiosity. What is it? What could that sound be? I have to know. I turn from my own path and begin the steep climb up the ridge. It’s a little daunting, not knowing exactly what I’ll find on the other side, but it’s about time I find out. I get closer…just a few more steps now…The closer I get, the louder the sound is in my ears and as I reach the crest I almost lose my breath at the sight before me. It’s a river! A huge, flowing, rushing river! With trees lining the sides, casting shade along the way. For a moment, I’m paralyzed by relief and excitement. This is the answer to all my needs! The refreshing I need is right there. The protection I need from the sun is under those trees. And in the hottest part of the day I can take off my shoes and actually continue my walk IN the water! Laughter bubbles up and I find myself dancing with joy. I take one look back at the wasteland I’ve come from, and as I turn to head toward the river I am struck with a realization. This river…this teeming, bubbling answer to everything…has been flowing along beside me my entire journey. As far back as I can see my path, I can see the river running as well. It was just over the ridge the entire time. I had heard the sound so often, but had never wanted to take the time to stop and find out what it was. Or there were the times I was positive that if I just kept going on the path I thought was best, I’d finally find an end point that could sustain me. And here…all along…everything I needed had been within reach. It’s too late to change my past…but each step from now on, I can’t even imagine ever walking apart from the river. What about you? Can you hear the sound of the rushing water? 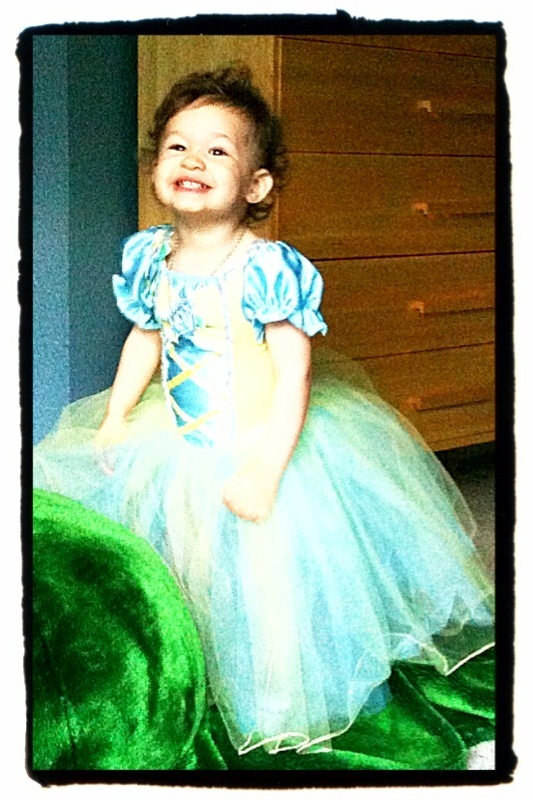 Oh to be a Princess! Having a daughter has completely changed our lives. But let me say that I love my boys and they love their mommy. They encourage me, they compliment me, they tell me they want to marry me. (I have purposefully not explained that someday they will think that very idea gross…I’ll just let them stay in their “Mommy is awesome” bubble for as long as it lasts.) I am so very thankful to have had three boys right in a row. I know I will always have an amazing bond with my little men. And then a princess was born! She is opposite our boys in every which way. They were all born over a week late…she was ten days early. They were all huge monster babies…she was 6lbs 1oz. The boys didn’t speak more than a handful of words at age 2…Cosette is not yet 2 and she is putting sentences together. The boys love good guys versus bad guys…Cosette loves sugar and spice and everything nice. A few weeks ago I decided it was time to even out the movie picks for our Cobler family movie night tradition. So I picked Cinderella 3…the boys all groaned! As the movie started, popcorn on hand, blankets and pillows strategically placed for optimum snuggles, Cosette crawled up in her Daddy’s lap in anticipation. Needless to say, Jon melted into a puddle of joy right there on the couch! “I’m the prince in my daughter’s fairytale!” He said with tears in his eyes. So I thought it would be fitting to share a picture of our little princess (Special thanks to Holly who gave her this adorable dress!) And just so everyone is clear…Jon has said that any young man intending to take his place as Cosette’s prince will quietly disappear and never be heard from again. Yesterday I had the honor of being part of a beautiful celebration of life. Family and friends came together to give thanks to the Lord for the blessing of little Jacob Raymond Collazo. Each of his 21 days on this earth were full of love and purpose in His plan. Adam and Shannon are new heroes of mine. The peace and comfort they carry in the midst of their own loss is inspiring and amazing. A letter from Shannon to her little boy was read and we could all hear the heart of a really good mom. Then Adam took the stage and shared, with honesty and grace, his gratefulness for the people in his life, the time they had with their little boy, and for a God whose love was carrying them through this time. It is in difficult times when the real us comes to the surface. There is no more faking it, no more hiding what really makes up who we are. Adam and Shannon…you are who you say you are. You are real. You are authentic. Your lives are full of God’s grace and blessing. Thank you for sharing so freely with the rest of us. Our lives are changed because of yours…and Jacob’s. There is an old song which was used to close out the service yesterday. May it be the cry of our hearts. Being in the stage of life I am right now as a mommy of young children I have plenty of friends around me who either have kids, are wanting to have kids, or plan to have kids in the not-so-distant future. And I say with a heavy heart that some of those women have been waiting a very long time to see that happen in their lives. They are ready, the time is right, but for varying reasons they are still waiting, wishing they could just will their bodies to do what they want them to do. I still remember when Jon and I decided it was time to start trying. I had wanted to start having children sooner than Jon. Don’t misunderstand me…He DID want kids, just not yet. He’s an ultra goal-oriented person and he had a five-year plan that didn’t involve children. I was ready the minute we said “I do” but instead of arguing, I just started praying. It’s a secret weapon of mine! Lo and behold, three years later just as the mommy bug was taking full effect, Jon suddenly changed his tune and we were off on our journey to become parents. It was amazing what happened next. As soon as we were ready to start trying I became a crazy woman. Instead of enjoying the anticipation of what would be coming, I was overwhelmingly scared and anxious. What if I couldn’t get pregnant? What if there was something wrong with me? What if it took a long time? What if…? If there was an “if” I was thinking it. And on top of that, everyone around me seemed to be pregnant. If they weren’t, they were asking why I wasn’t yet. And you know what God showed me? That He knew exactly when our baby needed to be conceived so that he would grow up to be in exactly the right elementary school he needed to be in. God had friends he needed to be a light to, and parents of friends we could share God’s love with. He would graduate with a specific class and be exactly the right age to meet the spouse God has for him somewhere. There was no mistake in the waiting. God had a plan and a destiny for me…for my baby…that was out of my control and I could find peace in knowing that He would make it all happen when it was right. I’ve never forgotten that. So here’s what I’m thinking about today…I know that there are women out there who have walked through infertility. I know there are some who have seen miracles where their bodies are concerned, and there are also some whose bodies never cooperated. I have friends who have adopted, and I also have friends who benefitted from the brilliance of modern medicine. I am not asking for the latest technique or doctor to see. What I am asking for is that those who walked through this at some point (or are currently walking through it now) and God spoke to you and helped you through it…please share!!! What did He say? What promises did you hang on to? All of us need to be encouraged, and you need to know that YOU can be an instrument in the hand of a loving God to bring hope and peace to someone else. So post your story. Post your encouragement so that others can be blessed. You will be blessed to know you were a light on a subject that can feel so dark sometimes. Yesterday was Mother’s Day. My ninth, actually, as an official mother. I was one of those girls who grew up dreaming of getting married and having children, so motherhood has honestly been a dream come true. But dreams, even the best of them, are sometimes a little different than we expected. Motherhood is by far the most rewarding journey I have undertaken. The beauty of holding a baby in the crook of your arm, hearing their breath against your cheek, hearing someone call out, “Mommy!” and realize that YOU are the one they are needing…what could be any more amazing? But the one thing I never imagined as I dreamed of having my own children was how truly overwhelming, how deeply scary, and how down-right lonely motherhood can be at times. Why didn’t anyone tell me my heart would leave me every time one of my kids goes out of the house? How did I never see in my own mom the struggle between being “Mom” and being just a woman?One of my favorite quotes comes from a Beth Moore bible study where one woman shared that her biggest struggle of being a woman was, “Feeling like I’m not enough, but too much all at the same time.” Oh my goodness! Talk about reading into my own heart with that one! So how does this all tie into my Mother’s Day? Well, my morning started out pretty good. I was up early, mostly ready for church before my kids even woke up (that’s a good morning, right moms?) Jon was already gone, which is normal for us on a Sunday morning. My heart was peaceful, and I was looking forward to an afternoon hanging out as a family. Then my kids woke up. Three of them were in great moods, wishing me love and sweet compliments for Mother’s Day. One was not. From the time he got out of bed, to when we actually got in the car to drive to church, he had managed to throw four chart-topping tantrums. As I drove away from our house he was in the back of the car screaming at the top of his lungs, informing me that he didn’t want to wear the shoes he had on and that this was the worst day of his life. As I pulled into a parking spot at the church, he was still crying and kicking the seat. My day had plummeted. I called Jon’s cell phone and he graciously rescued me. When I finally made it into the service and stood singing my worship, all I wanted to do was drive home, put my sweats on, and crawl back into bed. I was exhausted and crabby. Wow, what a great mother I was, right? I felt small and totally inadequate for my job as a mommy. I thought, “I’m never quite enough.” And then a still small voice spoke right to the raw openness of my heart. He always knows exactly what to say. Realizing that I all I need to do is be me is very freeing. I don’t need to be like any of my other amazing mom friends. There isn’t a special “Mom Point System” that keeps track of how I rate. I just need to be me. My personality is good. My quirkiness is fine. My talents are prefect. My love is the best possible for my kids. And even when I give everything I have to give, I know it will never be quite enough in my own strength…lucky for me, He makes up the difference. Take a look at what my boys did for me today! Yes, I cried. This has got to be the best Mother’s Day present ever invented!!! Yesterday Jon and I got the amazing opportunity to be a part of the National Day of Prayer held at the Washington State Capitol. I was touched by all the people who came to pray and seek God for our wonderful country. I was able to look across the crowd and see familiar faces mingled in with strangers…but my heart knew that one day those strangers would be my neighbors in the place God is preparing for us! It was such a great team this year, working together in unity to do what God had called us to do. I was humbled to be asked to participate, and what a gift to get to work along side my husband. For anyone interested in the text of Jon and my prayers from during our part of the ceremony, or the videos that were shown, just check out Jon’s blog. God’s doing great things in Olympia!!! It may not be November…There are tulips blooming in my yard instead of pumpkins on my porch, and yet I feel the need to remind myself of the things for which I am thankful. Isn’t it easy to be grateful when obvious blessing abound? (A new promotion, vacation with the family, true love.) But sometimes life is heavy, our hearts are tired, and it takes all we have to simply lift our eyes. I have recently watched in awe as a dear friend walks through some of the most heart-wrenching, soul-tiring circumstances. I have been amazed at her inner-strength, her resolve to look to the future, and her ability to not wallow but continue to find AND DECLARE the goodness of her God; a God she knows loves her and whose mercy endures forever. She finds each and every gift in life and thanks Him. She actively looks for the blessings and declares them to her soul…I want to be more like her. I am married to a man who truly cares about me as an individual. He honors and respects me. He desires me and makes me feel desired. He is a gentle, wise, strong father. I know he’ll stand by what he promised when he put the ring on my finger 12 years ago. I have four healthy children. All four pregnancies were without complications. I’ve never had a miscarriage. My parents are still in love and married to each other. I’m “Auntie Fawn” to a beautiful little girl. I live in a nice house and have enough room to have guests stay with us. We also have a dishwasher, washer and dryer, and heat when it’s cold outside. We have a yard for the kids to play in, and a neighborhood full of great families. I love the city in which we live…it just fits us. I have friends who know the real me and still like me. I have had the opportunity to travel. I have had the chance to exercise my creative passions and talents. I am alive. My body is working, for now, and I can still breathe on my own, sing to my God, and dance with my kids. I have a Savior who gave me the most precious, meaningful gift in my life…He chose me. I was sitting in my mommy-minivan with three kids strapped into their car seats as we waited for my oldest son to be done with his baseball practice. I’m sorry to say that not everyone in the car was peacefully waiting, simply enjoying the feeling of togetherness as we were jointly trapped. Unfortunately for those of us inside the Chrysler, I had not put shoes or coats on any of the little ones, and so I was now reaping the rewards of children who can SEE the playground, but can’t actually play on the playground. I know, a complete travesty. All of a sudden, some of the discontented moans turned into squeals of utter delight. I turned in my seat to watch my 6 year old, Andrew, tuck his head down into his t-shirt. My toddler daughter, who sat strapped in next to him, wore the most enraptured look on her face as she simultaneously screamed at the top of her lungs and kicked her feet. The response she got to this action was her brother’s head reemerging from his shirt with a resounding, “Boo!” Oh, the joy of a baby’s laugh!!! As I watched them repeat this over and over, I couldn’t help but giggle at Cosette’s almost over-whelming anticipation as she waited for Andrew’s head to pop out again. It was so exciting, so fun, that she could hardly contain her joy…she knew he was going to pop out. She expected it. That’s when I asked myself the question, “When’s the last time you were waiting for something, and were truly joyful about the waiting part, because you knew the One you were asking was going to answer?” Isn’t it true that when we have to wait for something, it can be hard to find joy in the wait? I think this is especially true when the thing we need is important to us…when we need an answer…when we need direction. Perhaps hearing from God is directly related to our own belief that He will actually respond. Perhaps if we really knew that the God we speak to not only hears our prayers, but wants to engage in conversation, we might take time to listen. So I suppose the question to myself and to those who need an answer from God is…what are you expecting?